[Blind Gossip] This took us a bit by surprise. These two Game of Thrones actors are in a relationship! Unlike that GOT couple who have used their relationship to promote the series, this couple is not interested in flaunting their relationship for the cameras. They are very happy together but they are also being quite private about it. Only a few of the cast and crew know about it. If it becomes public, it will likely be after the series concludes. We thought that one member of our new couple was in a relationship, but we are now being told that relationship is finished and both are single. Not Nikolaj Coster-Waldau and Lena Headey. [Optional] Who will win the Game of Thrones? I think it’s Lena Headey (who at least had a bf with her 2nd baby) and …? Just a shot in the dark here. Trying to figure out who shares screen time with the female characters. Khaleesi is with Jon Snow, I’m assuming that’s the “other couple”. Not Cersie since she’s in the photo. Sansa? Would hope she’s not with Littlefeather. Unless it’s a gay couple, hmmm…. Petyr Baelish will end up in the throne and Varys will be Hand to the King. Littlefinger will be killed by Arya so I doubt it. Sansa is with Joe Jonas, no?? LOL It sounds funny when using her character name alongside his real name hahahaha. I will guess Sansa, who was supposedly “dating” Joe Jonas. No idea who the guy is, there really aren’t many age-appropriate options that anyone would care about, and not Kit Harrington, who is a part of the previously mentioned couple who used their relationship for publicity. I think Jon Snow will win the Game of Thrones! And he’ll probably marry Dani, his secret aunt! And they will have all the power! SOPHIE TURNER AND KIT HARRINGTON. Optional: TYRION. TYRION IS THE ONLY DECENT AND KING ON THE SHOW. Not sure but would love it to be Emilia Clark and Kit Harrington! Wait… Is this one Tommen and his sister Mirsella? Younger children of the incestuous Lannister Twins? He was dating the girl who played Ygrette, but they are not together anymore. Optional: It is starting to look like Jon Snow will have the power in the end! Peter Dinklage and the Mountain. I hope this is true! Just thinking about their babies makes my ovaries explode. 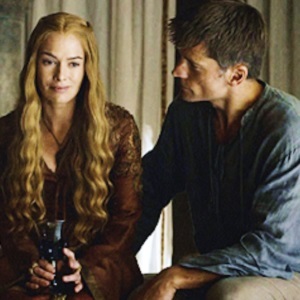 Considering the couple chosen for the picture, I’d say Maisie and Isaac (sibilings in the series, like Cersei and Jaime in the pic). They have been working closer lately and Arya was supposed to be in a relationship. Actors who play Gilly and Sam? I hope this is Kit and Emilia!!! Also a clue could be the photo of Lena and Nikolaj, who are related (brother/sister) on the show. Kit and Emilia are also related (aunt/nephew) on the show. Kit & Rose are engaged so it isn’t them. Emilia & Nicolaj? I’ll say Sophie Turner is the female half (assuming it’s a straight couple), since she was supposedly seeing someone. I have no idea why everyone’s guessing Kit Harington though, since he and Rose Leslie are the promotional couple and the blind doesn’t say this real relationship involves anyone from the PR relationship. Not sure who the guy is though. Maybe Alfie Allen? Because of the gender neutrality of this blind I was leaning towards Maisie Williams and Sophie Turner considering how close they are. But the second, more recent blind about the GOT couple says actor/actress. Throwing this guess out there anyway just for something different. I don’t think this is Kit because I’m pretty sure Ace is referring to him and Rose Leslie (who played Ygritte) as being the GoT couple who have used their relationship to promote the series. I know the two young actors who played Tommen and Myrcella are dating but both are no longer on the show. I’m going to go with Jacob Anderson (Greyworm) and Nathalie Emmanuel (Missandei). Both are pretty low-key and still (well maybe Greyworm won’t be–not for long) on the show. Kit and Emilia are what a bunch of people want, but the incredible lack of chemistry they have on screen makes me laugh. Jon Snow and Gendry have better chemistry. Tyrion should win, with Varys at his side. It’s easier to say who it isn’t. I doubt it’s any of the younger members of the cast, because most of them seem to use their relationships for PR. Saying it’s ‘Not Nikolaj Coster-Waldau AND Lena Headey’ rather than ‘Not Nikolaj Coster-Waldau OR Lena Headey’ seems like a clue, so random guess: Nikolaj Coster-Waldau and Gwendoline Christie. They’ve always seemed pretty close. They already hooked up together and now they can’t stand each other. They can’t even shoot together, which is weird beacuse they are both in King’s Landing and Jerome is the bodyguard of Lena’s brother/lover. Well, you said the relationship was a secret and you’re using two on-screen siblings in a “secret” relationship. So I’m gonna say Maisie Williams (Arya Stark) and Isaac Hempstead Wright (Bran Stark). He’s only 2 years younger than her. I think Jon and Daenerys will fall in love, Dany will lose her mind and Jon will kill her, like Azor Ahai killed Nissa Nissa (Claw will be the new Lightbringer). I’m not sure if Jon will reign though, he may be fatally wounded in the final fight against the Night King (and he wouldn’t come back because he would have already fulfill his purpose). I hope this was Alfie Allen and Sophie Turner but I doubt it. I think it’s probably Maisie or Sophie or Emilia for the female. Not sure about the guy but I don’t think it’s Kit.